If you’re planning to enter the business space especially the Chinese marshket, it’s best to learn first from Shanghai’s outstanding entrepreneurs. Apart from having the best business ideas, they also have valuable stories to share. Like you, they also had to start somewhere. They faced and endured many challenges before they successfully conquered the market. To inspire your entrepreneurial spirit, we gathered the best business advice from Shanghai’s awesome founders and managers. As an entrepreneur, you will encounter many trials and challenges. But it’s not what happens to you that matters, it’s how you choose to respond. Like Teresa Truda, you must maintain an optimistic mindset and learn to laugh. It will help you move forward, improve your strategies, and lead your team better. Remember, your attitude is infectious. If you have a winner’s mindset, your employees will also acquire it. Alex Horle knows how challenging the Chinese market is, especially to foreign entrepreneurs. So she focused on two things that will help her company stand out – knowing her market and building a good network. Researching your target market is paramount to the success of your venture. Knowing what people want, and how you can address this need, will help you create valuable solutions. A good network is also vital to your business’ growth, especially in China. Guanxi is an integral part of the Chinese business culture. That’s why it’s important for you to widen your network and meet other people who can support you. Even the best leaders and innovators commit mistakes. And like Charlotte Wang, you also have to treat them as opportunities to learn and improve. Failures play a fundamental part in your growth. They are your best teachers. Learn from them and use them to hone your ideas and skills. Chuan de La Hosseraye always surround herself with people that could help her become a better entrepreneur. Like Chuan, you have to seek a strong support system as well. The key is to have a strong presence in the entrepreneurial ecosystem by going to the right events. This can help you find other people that will give you professional, emotional, and mental support. Sze Kei thrived in change because of her ability to adapt. She was able to adjust to the different cultures and practices of the people around her. To be a successful entrepreneur, you need to be mindful and respectful of other cultures. This will not only make you a better leader, it will also help you create products that will surely align with your customers’ needs and values. Laurence Durand is the brain behind Superwomen in Data. Taking the concept of embracing diversity to the next level, she localized her business by assimilating with her target market. Understanding your market is one thing. But walking amongst them is an extra mile that can take your business to the next level. Elsa Wang keeps it short and sweet by sharing the importance of expressing your thoughts. Communication is a critical factor in the success of your business, so you must learn how to speak your mind. Provide honest feedback and clarify your expectations. This way, your team will steer in one direction while honing their skills. Fei Feng always incorporated a sense of creativity and imagination to the way that she approached her work. Like Fei, you should also learn how to be creative. Your ideas are one of the strong foundations of your business. By thinking outside the box, you’re helping your company innovate. You’ll be able to come up with business solutions that can boost the success of your venture. Evrim Kanbur’s personal struggles helped her find her purpose and passion. This also inspired her to create solutions for other people who have the same problem as her. Before diving into entrepreneurship, you must identify first if a project matches your level of passion. Why? Because your passion is what will get you out of bed when things get rough. Your inner desire to succeed and serve your clients will help you deal with challenges. So it’s not only important to find it. You also have to keep the fire burning. Rachel’s own definition of success is her motivators. Because of this, she was able to build her company and lead entrepreneurship programs. What does success mean to you exactly? It differs from person to person, and that’s a good thing. Knowing what you want can help you set your goals and jump-start your business. You’ll be more focused, which will let you exert effort and time on things that really matter. Veronique Lebel emphasizes the importance of administrative duties on top of creative tasks when running a business. Remember that you are your own boss now, so it’s also up to you to keep your business up and running. You may consider hiring help, but you must always have a general overview of what’s happening in your business. Marcella Davie believes that you must give yourself permission to fail, and always go for it. Remember, you learn by doing and by falling. Take the leap and forget about the “what ifs”.You can take time to plan about how you’re gonna do it, but it takes courage to actually execute. 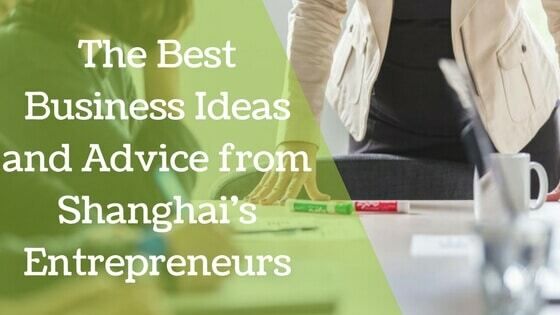 What’s the best business idea and advice that you learned from Shanghai’s top entrepreneurs? Let us know in the comments!